This was really on impulse. Paid fifty squids and got myself a rather decent seat, considering I bought it (legally) 6 hours before the gig! Eric Clapton was in town, and what better way to enjoy a Friday night, devoid of any more blimmin’ revision! Clapton had himself some new faces in his backing band on tour. In fact some of the faces are actually ‘new’ – they’ve been playing with Mr. Slowhand on and off in the past. One chap whose playing I was looking forward to check out was none other than Derek Trucks. He fronts his own band (aptly called the Derek Trucks Band) and is also the guitarist for the Allman Brothers Band, following the footsteps of the late Duane Allman and Warren Hayes (now of Government Mule). What’s more interesting is, this is the third ever collaboration of Clapton with a member of the Allman Brothers Band (Duane in Derek & The Dominos, and Chuck Leavell during the eponymous MTV Unplugged sesh). The Robert Cray Band opened the evening. I know of him, of his signature series Strat and of his co-authorship of Clapton’s Running On Faith, but I really haven’t listened to his stuff. They played five or six numbers, infused with the blues as opposed to it being full on. Cray played a couple of songs (Poor Johnny and Twenty) from his current album, Twenty. The crowd at the Hallam FM Arena was similar to that I saw a year ago at the Cream reunion gig. The couple sat next to me was old enough to be my dad’s younger brother and sister. The arena appeared packed with the occasional empty seats. In fact, a row of eight seats in front of me was empty. No obstructed view this time! 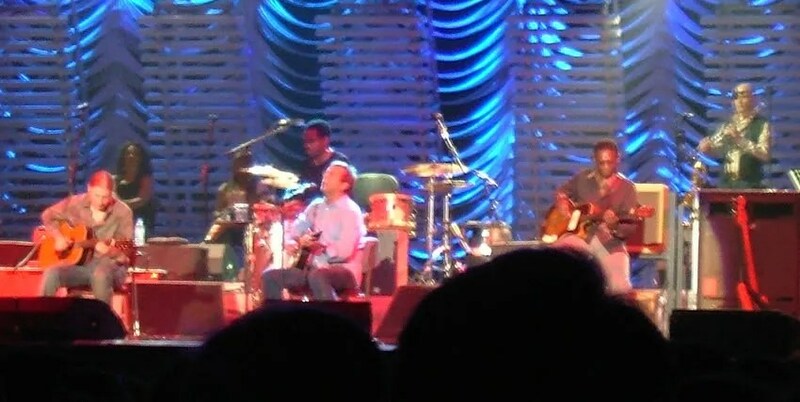 Clapton and his band got up onstage at quarter to 9 prompt, belting out Pretending from his Journeyman album. Doyle Tramhall II and trucks took turns playing licks, and in my opinion, Bramhall was easily upstaged by Trucks, whose relaxed slide playing was way beyond his years. No offence to the son of SRV’s collaborator, but it looks like Derek Trucks is the guitarist to watch in this tour! So Tired was great, without the crying baby, which then segued to Derek & The Dominos’ Got To Get Better In A Little While. Guitar-wise, Clapton switched between a black and an Inca silver Stratocaster throughout the gig. Two tweed Cornell 1×12″s were noted in the background. Clapton did a short acoustic segment midway through his set, kicking off with Jimmy Cox’s Nobody Knows You When You’re Down & Out. Usual Unplugged staples like Running On Faith (Truck’s slide playing was out of this world) were performed together with the newer Back Home. Where would Clapton be without Robert Johnson? RJ material performed this evening included Milkcow’s Calf Blues and Little Queen of Spades. As promised, Clapton did play a few of his older material, some of which were obscure like Any Day (another Derek & The Dominos number), the others being your usual crowd pleasers, Wonderful Tonight and Layla. Yes, the audience definitely lapped up those ones! Cocaine was definitely fantabulous, and as an encore, Clapton did Robert Johnson’s Crossroads. No Sunshine Of Your Love but that’s ok – I saw the real thing this time last year at the Albert Hall. Muahahaha. The set list hardly changed at all for this tour. I suppose that’s what you get when you have different bandmates each time you tour. Definitely for Clapton aficionados, this gig. I know the neon would have loved it. And for those who only know Clapton for Tears In Heaven and not much else, I’d say you’d better spend your hard-earned cash elsewhere. *Oh ya, mau tengok apa lagi saya tangkap dengan kamera digital saya di gig ini? Klik sini. OK, I might’ve been front-row-centre at E.C.’s gig in Belfast 2004, but Derek Trucks on Running on Faith is just tooo much! I can’t even imagine it. The solo on that was like a madwoman yang baru kehilangan lelaki kesayangannya and not because she loves him. Because he died leaving her and 10 kids with no money. eh? steve gadd ngan nathan east tak main eh? tak. and not to worry, it’s a two-year tour. he’s sure to head stateside soon! doyle bramhall the 3rd…he is my idol now… plays the same way i do… aku dok tgh buat tele custom thinline ’72 dude… just like his.. omigod i got G.A.S…!!! !